Most famous for the exquisite medieval “The Lady and the Unicorn” tapestry series, the Cluny was built between 1485 and 1510 on top of the ruins of a Roman bath, and is one of the most beautiful buildings of medieval Paris. The five panels of tapestries depict many features of the Middle Ages--a lovely and noble lady, an entranced unicorn, house pets and an allegory of the five senses—sight, smell, hearing, touch, and taste. In addition to the tapestries, you can see Roman baths which were the center of town during the Roman years, a large vendange (grape harvest celebration) tapestry, stone heads of the biblical kings of Judah from Notre Dame, and Byzantine ivories and altarpieces. The Cluny also has a fine collection of medieval art. 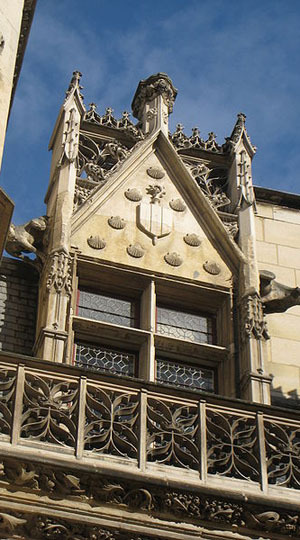 The Cluny was built in the flamboyant style of the late Gothic period in the 15th century by the Benedictine abbey of Cluny in Burgundy as a town house for its abbots. The Cluny is one of the two (along with the Hotel de Sens in the Marais) remaining vestiges of aristocratic mansions built during the Middle Ages in Paris. The house had many changes of ownership after the medieval period, and was acquired by the state in 1842. Free admission the first Sunday of the month. 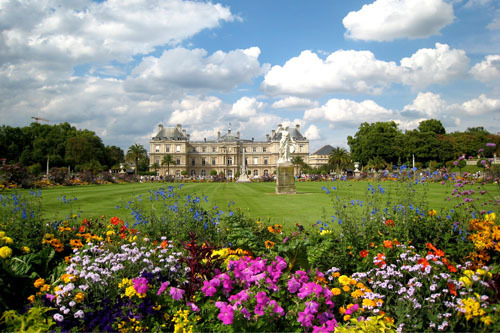 Commissioned by Marie de Medicis to resemble her childhood home in Florence, the Luxembourg Gardens are formal Italianate gardens which sweep down from the Luxembourg Palace (now the seat of the french senate) in every direction. Since the 1700's, when the garden was open to the public, locals and visitors have been able to appreciate the Medicis Fountain, the bronze replica of the Statue of Liberty, ornamental gates, grassy spaces and shrubbery. With plenty of seating to enjoy a picnic and watch the world go by, this is a great place to take a break from sightseeing. Two hour guided tours are available for around $70. Notre Dame is the most beloved of French churches, both by the French and by foreigners. Dedicated to “Our Lady,” the mother of God, its location is at the spiritual (though not geographic) center of France itself. Since the Middle Ages distances from the city to all parts of France are calculated from a spot in front of the cathedral, marked by a bronze plaque, “Kilometre Zero.” The area around Notre Dame is crowded day and night with tourists and young French entertainers, making this a must-see spot. Notre Dame’s location on the Seine is also unforgettable, with impressive and inspiring views of the cathedral seen by day and night. And for the hearty, a climb up the 400 steps to the tower will afford an up-close view of the gargoyles, and a panoramic view of Paris and the Seine. The Romans conquered the early Parisii tribe and built their Temple of Jupiter (52 B.C.) where Notre Dame now stands. Then with the fall of Rome, the Germanic Franks built the first Christian basilica on the site in 528 A.D. In 1163 the building of the cathedral began; the local people did most of the work —lugging and heaving huge stones, excavating for the foundation—all with arduous manual labor. Their only pay would be their reward from God. After two centuries of labor, the Cathedral was dedicated in 1345. 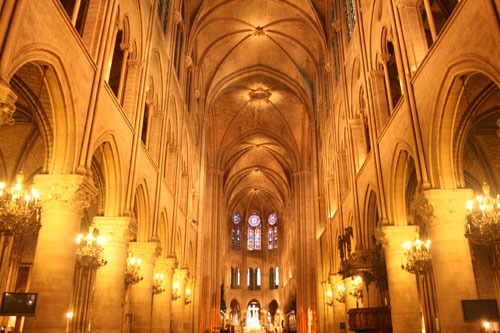 Many important historical events took place in Notre Dame: men prayed here before leaving for the Crusades; Joan of Arc was canonized here; kings and queens were sometimes crowned and married here; the liberation of Paris was celebrated on August 26, 1945. 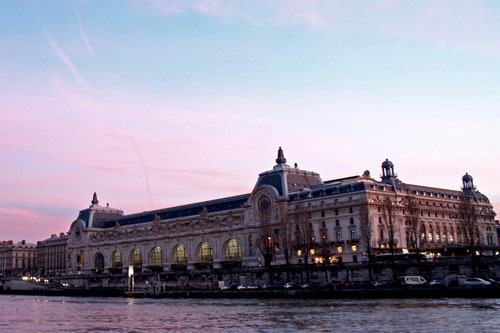 Bus: 21, 48, 47, 85, 96--Cite--Palais de Justice stop; 47, Balabus--Cite--Parvis de Notre Dame stop; 24, 47--Notre Dame--Quai de Montebello stop; 24, 47--Petit Pont stop; 24, 27: Pont Saint-Michel – Quai des Orfèvres stop; 24, 27, 96, Balabus: Saint-Michel stop; 21, 27, 38, 85, 96; Saint-michel – Saint-Germain Stop. This museum opened to the public in 1986. Housed in a converted train station, the open architecture alone is worth a visit. Filled with an outstanding collection of impressionist art, the space and the art collection are at the top of every visitor's to-do list. The downside of this popularity is the long wait to purchase tickets and enter the museum. Plan ahead and purchase tickets online for the next day and beyond. Is in the 7th arrondissement, at the limit of the 6th. The French wanted to show the world how much progress they had made in the 100 years since the Revolution of 1789, so French engineer Gustave-Alexandre Eiffel built the Tour Eiffel for the 1889 Universal Exhibition, commemorating the revolution. The tower’s only function was to impress and show the world that France had the wealth, knowledge and spirit to build the world’s tallest structure. However it was controversial and many notable Frenchmen protested its construction. The tower is about 1,050 ft tall, but the height can vary by 15 cm depending on the temperature. It weighs 9,444 tons. Once famous as the world’s tallest building, the tower was intended as a temporary structure but the "new" communications technology of radio saved it from destruction, since it was the perfect spot for a radio (since 1918) or TV (since 1957) antenna. 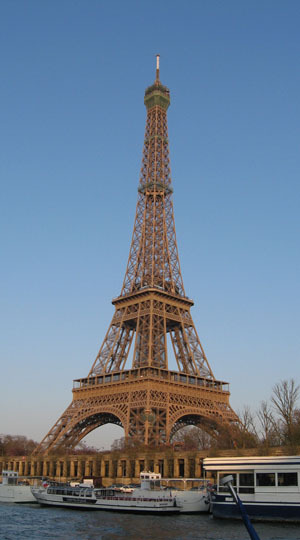 The Eiffel Tower is the most visited monument in the modern world. The tower has three observation platforms, at 200, 400 and 900 feet. To reach the top level, visitors must take two separate elevators. Fitness buffs or avid photographers can take the stairs—and there is never a long line-- 328 stairs to the first level, and 360 stairs to the second. The hike up is partially along an enclosed staircase, but it can still be unnerving. Walking is the least expensive way to see the tower. There is no greater view in Paris than the 360-degree view from the second level. The best time to go is just before sunset. In clear weather you can see almost 60 km from Paris. Price: 15 Є (16.1 USD) Access to the permanent collections and temporary exhibitions in both the Louvre and the Musee Eugene Delacroix. Under 18s free. The Louvre is the world's most visited museum and Europe's largest museum, with approximately 35,000 works of art on display. The original building, which was to become the oldest museum in Europe, was built at the end of the 12th century as a fortress. As Paris grew, the structure was rebuilt and became the palace and residence of Francois I and then later Louis XIV, the Sun King. The exhibits are housed in the 16th century palace, next to the ultramodern (and controversial) I.M. Pei glass pyramid which allows sunlight to filter in and brighten the underground reception area. Although the Louvre's most outstanding exhibits are Greek sculpture and French and Italian painting, the collections are divided into eight categories: Egyptian Antiquities; Near Eastern Antiquities; Greek, Etruscan and Roman Antiquities; Islamic Art; Sculpture; Painting; Decorative Arts; and Prints and Drawings. The collection includes the ancient to mid -19th century art. With the huge number of exhibits and sheer size of the Louvre, visitors must be selective about what to see. 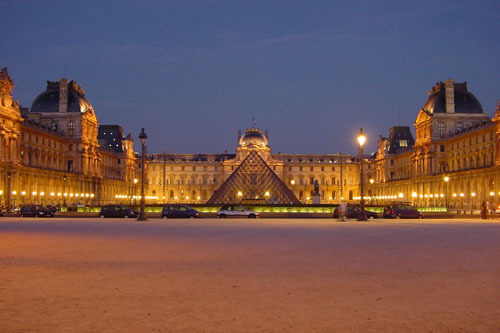 Consider visiting the Louvre several times, concentrating on different collections with each visit. Guided tours are advisable, especially if you don’t have a lot of time. The device guides visitors through the five kilometers of exhibits, and provides personalized visits. There are several cafes in and around the Louvre. Free admission for all on the first Sunday of every month. Paris museum 2 day pass costs 42 euros. Wandering amongst the deceased may not sound like much of a day out, but in Paris' Père Lachaise Cemetery you are wandering among legends. 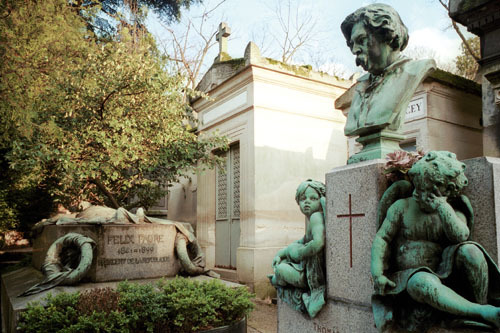 Although operating as a regular family cemetery for normal Parisian families, this sprawling graveyard in the 20th Arrondissement is also the resting place of choice for many famous people. Visit the graves of rocker Jim Morrison, novelist Marcel Proust, playwright Oscar Wilde, singer Edith Piaf and composer Frédéric Chopin. Opens at 8.30am on Saturdays and 9am on Sundays. The cemetery closes at 5.30pm during the winter months. Metro Père-Lachaise on lines 2 and 3. Transfer from the RER at Gare du Nord, then a 15-minute journey. 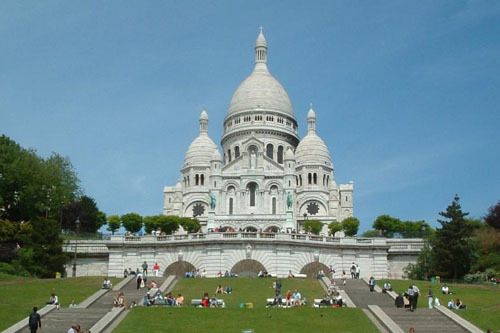 Sacré-Coeur Basilica is one of the most photographed sights in Paris. The huge white church dome sits at the city's highest point, commanding fantastic views over the streets below. The church was completed in 1923 as a monument to the 58,000 soldiers killed in the Franco-Prussian war. Step inside to find a cool, quiet world where priests pray for the souls of the dead 24 hours a day. Sunset is particularly spectacular from the viewing areas to the front of the church, followed by a stroll through the streets of Montmartre. Located close to Anvers Metro station on line 2. Take the funicular to the basilica from the base of the hill to avoid the climb. Transfer from the RER at Gare du Nord. then a 5-minute journey. You'll walk along the Latin Quarter's ancient streets and see Paris' three most beautiful churches: Notre Dame Cathedral, St. Chapelle and St. Etienne du Mont. You'll also pass famous institutes and universities, exquisite fountains and statues, art treasures from the Middle Ages, student haunts and the Left Bank abodes of Sigmund Freud, Ernest Hemingway, Pablo Picasso, the beat poets and Jim Morrison.